Black carbon particulates are one product of burning fossil fuels and other organic matter. In the past few decades, the media has paid a lot of attention to greenhouse gasses such as carbon dioxide and the role that they play in warming the earth's climate. There are, however, several aerosols which also have a significant impact on regional and global climate. One of these is black carbon. Black carbon - which is essentially the soot that results from the incomplete combustion of fossil fuels (petroleum, coal), biofuels, and biomass (wood, animal dung, etc.) - is the most potent climate-warming aerosol. The aerosol enters the atmosphere from automobiles (those with diesel engines being particularly high emitters), coal-fired power plants, wood stoves, kerosene lamps and forest fires. If produced continuously, and in large quantities, these can have a surprisingly large impact on climate, especially in the cryosphere. In fact, the latest research shows that black carbon is second only to carbon dioxide as far as major contributors to climate change. Soot produced by fossil fuels and biofuels combined may contribute to about 16% of gross global warming, according to Dr. Mark Jacobson, Civil and Environmental Engineer at Stanford University in California, one of the first climate modellers to integrate black carbon into the latest generation of climate models. After being emitted, black carbon particles can remain suspended in the atmosphere anywhere from a week to four weeks before they are "washed out" and return to the earth via settling or precipitation. While suspended in the atmosphere, the presence of black carbon particles has a net warming effect. Unlike greenhouse gasses, which trap infrared radiation that is already in the earth's atmosphere, black carbon particles, being black, absorb all wavelengths of sunlight and then re-emit this energy to the surrounding environment as infrared radiation. One place where black carbon particles can continue to have an impact once they reach the ground is in the cryosphere, particularly in the Arctic, which is polluted by black carbon aerosol transported through the atmosphere from its source, the highly-industrialised areas of the Northern Hemisphere. When pure, snow is very white and thus very effective at reflecting solar radiation from the earth's surface. If soot particles enter the snow, even in concentrations as small as ten parts per billion (which is undetectable to the unaided human eye), this reduces the snow's albedo, allowing it to absorb more solar radiation and allowing it to melt more readily. Experts believe that black carbon has been responsible for significant warming in the Arctic. As much as 30% of the warming in the Arctic since pre-industrial times can be attributed to anthropogenic black carbon, according to Dr. Charles Zender of Earth System Modeling Facility at the University of California, Irvine, who is an expert in modelling atmospheric aerosol transport to the Arctic. During Arctic winters when there is little sunlight, the presence of dark soot particles in the snow doesn't make much difference. Only when solar radiation begins to increase rapidly in the spring and the melting season begins does black carbon have its greatest impact on snow cover. The presence of black carbon on the snow makes it absorb more solar radiation than it otherwise would, leading to more intense melting earlier in the spring. As snow and ice melt, this exposes darker, less reflective surfaces such as land and open water and creates a positive feedback situation which leads to accelerated melting, commonly referred to as snow-albedo feedback. As far back as the 1870s, early Arctic explorers gave reports of Arctic haze and dirty snow, although none were able to connect it to the heavy pollution caused by the rapid industrialisation taking place in Europe and North America at the time. One common explanation at the time was that some sort of dust from meteors was responsible for the haze and impurities in the snow. It was not until the 1970s that research on Arctic haze led by Dr. Glenn Shaw of the University of Alaska, Fairbanks began to reveal that it was in fact possible for polluting aerosols to travel thousands of kilometres through the atmosphere from sources in the lower latitudes and reach the Arctic. No one began to consider dark aerosol as an important climate forcing agent until the early 1980's, during the nuclear winter studies, in which researchers tried to speculate as to what would happen if a lot of dark aerosol were pumped into the atmosphere and the Arctic snow pack as the result of fires following a nuclear holocaust. In 1983-84 Dr. Tony Clarke and Kevin Noone, his student at the time, of the University of Washington, Seattle became the first team of researchers to investigate the potential impact that black carbon might have on snow albedo and on the regional Arctic climate, taking snow samples from multiple locations in the Arctic, and examining the snow and the black carbon pollution it contained in a lab. Despite this initial investigation focusing on black carbon as a significant climate forcing agent, climate modellers didn't pay much attention to black carbon for another decade or so. Around the turn of the 21st century, Dr. James Hansen from NASA's Goddard Institute for Space Studies and Dr. Jacobson from Stanford University in California began factoring black carbon into the most recent generation of climate models, and began to see how potent black carbon is relative to other climate forcing aerosols such as carbon dioxide. In 2000, Dr. Jacobson determined that black carbon is most likely the second-leading cause of global warming after carbon dioxide. Since then, this estimate has been backed up by other researchers, including Dr. Zender, Dr. Greg Carmichael from the University of Iowa, and Dr. V. Ramanathan of the Scripps Institution of Oceanography at the University of California, San Diego. "You have to keep in mind that we couldn't have begun to understand how to take black carbon into account until we had global inventories of carbon emissions,' explained Dr. Zender. We only started getting crude estimates of anthropogenic black carbon emissions in the mid 1990s, and it's only since 1997 that we've had any satellite records of global biomass burning such as forest fires." Data taken from in-situ observation and ice cores from the Greenland ice sheet show that black carbon emissions dropped by the mid 20th century as Europe and North America began to move away from relying on solid fuels such as coal and wood for everyday household energy and moved towards cleaner alternatives. A significant drop in black carbon output was also observed in the early 1990s as the collapse of the former Soviet Union led to an abandoning of the heavily polluting industries it controlled. Black carbon concentrations in some parts of the Arctic have been on the rise again since 2000, however, reflecting the increase in dirty emissions that that developing countries such as China are producing. 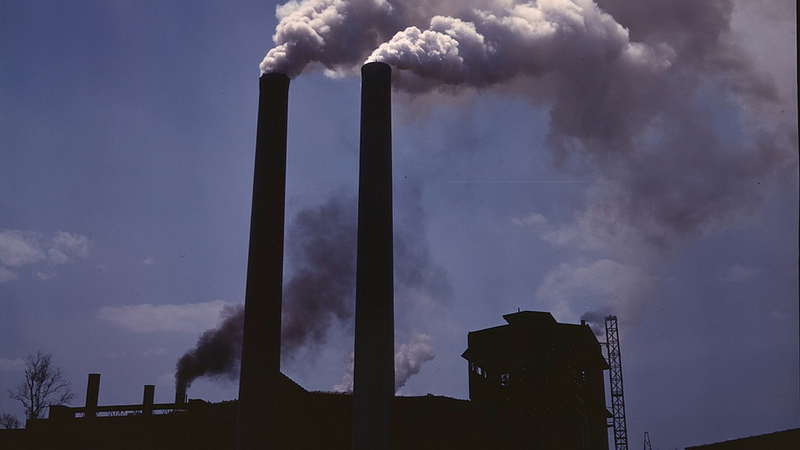 In fact, the majority of black carbon emissions across the planet come from developing countries which are still in the process of moving from dirtier-burning solid domestic fuels and heavily polluting automobiles towards cleaner household energy and cleaner modes of transportation as standards of living improve. This is why it would be important to include them in any international initiative aimed at reducing black carbon. Another important factor to keep in mind is that retreating Arctic sea ice will also indirectly lead to more local black carbon emissions. If the Northern Sea Route and the Northwest Passage remain open for longer periods of time each year, ship traffic through the Arctic will rise, adding a significant source of locally-produced black carbon in addition to the pollution the Arctic receives from lower latitudes. Since black carbon particles remain in the atmosphere between a few days and a few weeks, and since their impact on climate warming is far from negligible, removing them would have an immediate impact. "Carbon dioxide emitted into the atmosphere has a very long lifespan, usually between thirty to a hundred years," explained Dr. Zender. "If all CO2 emissions were to stop today, it would take decades before you would see any positive impacts. In contrast, if black carbon emissions were cut today, it would be possible to see positive results, especially in the Arctic, almost immediately." Experts point out that reducing black carbon emissions should not be seen as substitute for reductions of greenhouse gas emissions, but merely as a way of buying some time. In order for any mitigation strategy to work, it would need to address reductions in both. It is possible to have "faster cooling if you control the black carbon compared to the CO2," said Dr. Jacobson in testimony at a hearing on black carbon before the US House of Representatives in October 2007, "However, you want to do both simultaneously." The sources of black carbon emissions are also sources of greenhouse gas emissions, - diesel-powered cars, for example. However, reduction in output of one does not automatically translate into a reduction in the output of the other (there are filters that can be attached to diesel-engine vehicles, however they reduce fuel efficiency and lead to greater production of greenhouse gasses). "Evaluating all emissions from a single source is more comprehensive and more accurate than looking at the effects of individual chemical species," stated Dr. Tami Bond of the University of Illinois, Urbana-Champaign in her testimony before the same US House hearing on black carbon. "No current efforts on climate mitigation are evaluated in this way." Meanwhile, the scientific community continues to conduct research on black carbon. Dr. Steve Warren, Professor of Atmospheric Sciences and of Earth and Space Sciences at the University of Washington, Seattle talks about his current research project, in which he is taking Arctic snow samples from different locations across the Arctic and bringing them to labs to be analysed. The project is a follow-up to the broad-scale survey of Arctic snow that Clarke and Noone were involved with back in 1983-84. Dr. Charles Zender, Associate Professor and Director of at the University of California, Irvine and Dr. Florent Dominé, CNRS Research Director at the Laboratoire de Glaciologie et Géophysique de l'Environnement (LGGE) in Grenoble, France, talk about Dr. Dominé's new optical device used for measuring snow reflectance, and how they are using this device to measure snow reflectance with significant amounts of black carbon in it in order to verify Dr. Zender's models. "Black carbon...is the most potent climate-warming aerosol."